Papaya is a wonderful tropical fruit to add to your baby’s diet. Learn about papayas and try some of our papaya baby food recipe ideas too. Papayas are not only sweet, versatile and tasty, they are also a very nutritious fruit. They contain high amounts of Vitamin C (helping absorb non-heme iron), Vitamin A (2516 IU’s.) and even Vitamin E. Papayas are also a good source of fiber and folic acid. Like Mangos, papayas are tropical fruits and their age for introduction is varied – while they may make a great first food, they are probably not good as THE first food for your baby. Many parents offer their infants papaya as a later first food. Most often, papaya is offered after the foods that are most easily digestible (sweet potato, avocado, squash, banana for example) have been introduced and well tolerated. Papaya is most often introduced to babies between 7-8 months of age. According to the EWG, papayas are not one of the “dirty dozen” foods that are most highly contaminated with pesticides – purchasing organic is a personal choice. Papayas are a bit delicate in that they bruise easily and while the skin/peel is thick, bruising may cause the fruit to begin to rot or may be indicative of rotting. Depending on the type of papaya, you want to look for a reddish/yellowish color. Papayas that are nice and green with a little bit of yellow are fine to choose but these will not be ripe so you should ripen them on the counter. The papaya should be a bit firm but not completely hard. There should be a subtle sweet fragrant smell to a ripe papaya. Papayas will ripen on your counter but be careful as they may ripen faster than you expect. You can store an uncut papaya in the fridge and also store prepared chunks of papaya in an airtight container in the fridge. Do not store peeled and prepared papaya on the counter. 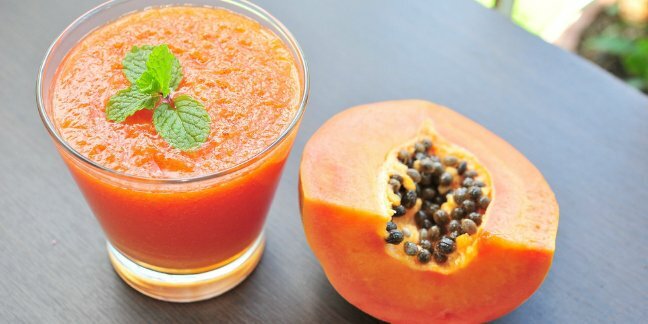 Best Way to Prepare Papaya for Baby Food? Preparing papaya is very simple. To prepare a papaya for your baby, all you need to do is peel it, de-seed it, slice and/or dice it. Once you have done this, mash the papaya into a consistency your baby will tolerate. The seeds are edible however they are peppery tasting and would not easily digest in a tiny tummy. Papaya is a great finger food also. Cut the papaya for your baby into small dices and serve. Some parents who have infants with sensitive tummies will give fruits a gentle steaming to help break down the sugars and fibers for easier digestion. If you feel this is the case for your infant, chunk the papaya and then steam for 5-10 minutes until very soft. You may wish to steam papaya chunks for a bit to soften them and enable easier digestion. Step 2: Cook over medium-low heat for 30 minutes or until rice is soft, fragrant and a bit soupy. Step 4: Add more water if needed and stir frequently to stop sticking to the pot and add more milk or water if necessary. Once the mixture is fully cooked, allow to cool for 10 minutes and then transfer to a blender or food processor. Puree or chop as needed for your baby’s age and texture requirements. This makes a great finger food meal for older babies and toddlers alike. The Papaya I Bought Smells FOUL.